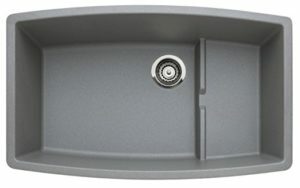 Best Composite Granite Kitchen Sink - Reviews and Styles 2019! Last Updated: April 12th 2019 We all spend the majority of our time at home in the kitchen. Whether it’s washing up, cooking, cleaning or anything else we’ll find we’re hovering around the kitchen sink a lot of the time. The kitchen sink is the centre point of any kitchen and it’s important that it’s the right one. Owning the best composite granite kitchen sink can really transform your kitchen! There’s a load to choose when it comes to kitchen sinks. First you’ll need to examine the styles on offer. A traditional kitchen will benefit from more traditional fittings while a modern kitchen needs more fancy pieces. The best place to start when choosing your kitchen sink is by finding the right materials. 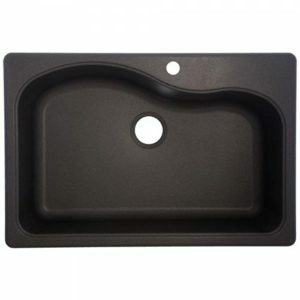 Composite granite sinks are made from a mix of different materials and while they do feature granite heavily they are different from solid granite sinks. Composite granite is generally used because of their durable nature. They resist any damage well and can withstand extremes in temperature well, this is a useful skill in a kitchen sink. It’s also a more affordable alternative to solid granite. If you like the look of acrylic sinks, check out our reviews! Or our Cast Iron sink reviews! 1 Top 3 Best Composite Granite Kitchen Sink Choices! Top 3 Best Composite Granite Kitchen Sink Choices! 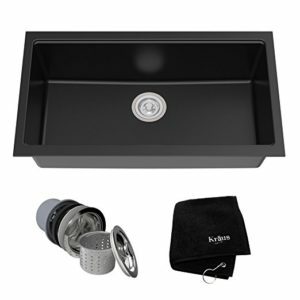 The Kraus KGU-413B 31 inch Undermount Single Bowl Black Onyx Granite Kitchen Sink is made for the modern home. Kraus themselves have designed and manufactured a number of different furnishings for the whole home but specialise in kitchen products. The Kraus kitchen sink is made from 80% natural granite and looks exactly like real stone. It has a smooth feel but gives a stylish look immediately to any kitchen. It weighs 30.4 pounds and is solidly constructed. This kitchen sink is one of the most durable in part because of the thermal finishing process used on the composite granite. It can withstand very high temperatures which is perfect for when you’re dealing with lots of hot pans. It’s also resistant to chipping so if a dish accidentally slips it won’t cause lasting damage. The kitchen sink is made to be used even late at night and has sound absorbing properties to limit the noise pollution. The water and noise from dishes is severely limited so you can use it early and late without disturbing the family. It’s resistant to staining which helps protect the natural colouring and the easy to clean nature means you don’t have to use stronger, potentially harmful, chemical cleaners. This means you can maintain your sink for longer. The Kraus kitchen sink looks good but works better. It’s solidly built but not cumbersome and will fit into most kitchens. This is definitely a model to check out for the quality and durability offered. The Blanco 440067 Performa Single-Basin Undermount Granite Kitchen Sink comes in metallic grey which is a great alternative to the traditional white models. It’s built with two sections so you can leave dishes to soak while still cleaning in the other. The grey kitchen sink gives the feel of solid stone without the cumbersome weight of solid granite. The material is easy to maintain and clean and most stains can be wiped off simply. The drain is off to the centre to allow you to use more base space for dishes. The extra deep bowl allows you to completely submerge any large pans, trays of pots that you might be using. This is especially useful for bakers who use a lot of bigger instruments when baking. A wider drain is used so you can quickly empty the sink when needed. A strainer can be used to remove any solids which can then easily be removed. Blanco have put a lot of effort into designing a kitchen sink that’s stylish but practical. The easy clean surfaces mean you can keep it shining and the modern look will attract compliments from whoever sees it. Blanco are well known for their products and the quality behind them. They use specialists to design and manufacture their kitchen sinks so that they’re all consistently well made. The reliability of this sink is matched only by the style. A great value product which is an asset to any home. 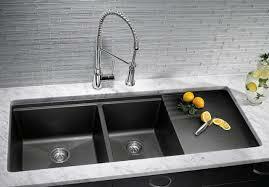 The Franke Gravity Dual Mount Granite Single Bowl Kitchen Sink is available in the graphite colouring and style. This is the simplest design of our top three picks but it’s still a very well made piece of kit. This sink drops straight into your unit and is made to be easy to fit by anyone. The drain is off centre so the space can be used most effectively. This composite granite construction shows the high construction values of Franke and it weighs 43 pounds. This is more than most mounted sinks and helps add to the durability of the unit. A template and the hardware needed for safe construction are all included in the product. A sanitized built in protective barrier has been built into the kitchen sink. This helps to fight bacteria during the whole cleaning cycle and keep the sink clean even when dealing with very dirty dishes. This helps keep your dishes clean and your whole family safe. A 9 inch bowl is used in the sink which is ample for any large dishes, pots, pans or trays. It allows you to soak them or stack dishes so they’re out of the way, freeing up more surface space. The sink can be cleaned with just a simple sponge and soap with no need for expensive chemical cleaners. This also helps preserve the material and limit any damage to the surface of the sink. Franke have created a simple but effective kitchen sink that has a crisp and clean style. It blends right into the kitchen with dark colouring that works in any modern home. It’s one that is extremely useful and Franke are offering some good value. Certainly one to check out when browsing for a new sink. Composite granite is one of the best looking materials for kitchen sinks and has a number of properties that make it well suited to the task. All three of these sinks have built several useful features into their units and combine utility with elegant style effectively. If you didn’t find a kitchen sink that you truly loved, check out our Miseno sinks reviews and you might find a sink you love! If you’re looking for a good looking kitchen unit then all three of these kitchen sinks are suitable. It’s a good place to start when you’re starting your search.